Front Camera is a simple application for taking still photos with the front camera - nothing more, nothing less. It does not support capturing video or using the back camera. Due to hardware limitations the photos have limited quality and resolution. Harmattan PR1.2 or later is required for stable operation. Tap on the shutter button or the viewfinder to take a photo. 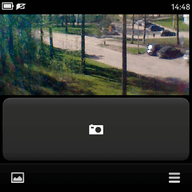 The photos are stored in the default photo location. Tap on the gallery button or the information banner to open the Gallery. i have see u or u go.